Whether you are looking for temperature sensors for for rolling stock, transmitters or heating processes for the melting furnaces used to manufacture rail equipment, Pyrocontrole places its thermal process expertise at your disposal. To meet the specific requirements of of the Rail industry, Pyrocontrole designs and manufactures high-performance temperature sensors and transmitters specially adapted to handle the specific features of the sector. Applications: temperature measurement in factories making rail equipment, on-board temperature measurement instruments for checking the batteries, traction systems, axle boxes and air-conditioning. Conversion of the Pt100 input signal into a 4…20 mA analogue signal for temperature scaling. The purpose of this sensor is to monitor the temperatures of the gear motors. The screw-on resistance sensor acquires the data in real time. Unaffected by vibrations, this can be used to monitor the temperature of the pressurized oil in hydrodynamic transmission systems. 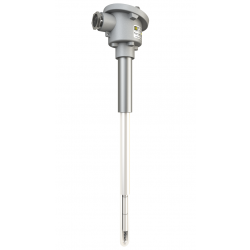 Installed on the ducts of train air-conditioning systems, this platinum temperature probe with built-in connector can be used to check operation of the air-conditioning, which is crucial for passenger comfort. This innovative lightweight measuring instrument enables TGV high-speed train drivers to measure the precise temperature of the axle box by contact measurement with the built-in Pt100 sensor. With its colour coding for each temperature threshold, this thermometer is particularly quick to read.